Northumberland Mam: Glam Goo - Fantasy Slime Pack - Review! Over the past month or so we have tried out a couple of Glam Goo sets. First was the Glam Goo Deluxe Slime Pack and then the Glam Goo Confetti Accessory Pack. We were lucky to be sent another accessory pack to try out. The Glam Goo - Fantasy Slime Pack. I say we but it was all for Ellie....She is still crazy about slime!! 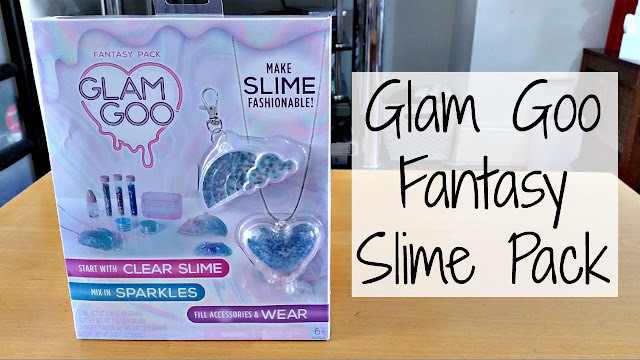 Make slime fashionable with Glam Goo! Start with clear slime, mix in sparkles, fill your accessories and wear! The fantasy theme pack comes with two wearable slime accessories. A heart necklace and a rainbow charm. There is of course a tub of Glam Goo (clear slime), three slime decorations. Mermaid Wishes, Cosmic Dust, and Unicorn Fuzz, two shimmer colours. Mint Skies and Magic Hour and one scent. Rose Mist. She played with this set for at least a couple of hours and has been back to it again and again! I don't think she will ever get sick of slime. All of the Glam Goo sets we have tried have been fantastic and this one is no different. Ellie has loved each and every one including this one. You can buy the Glam Goo - Fantasy Slime Pack from Smyths for £14.99. I would say it is well worth the money for the enjoyment my girl got from it. We were sent the Glam Goo - Fantasy Slime Pack free of charge in exchange for this blog post. I must admit I'm pleased that slime isn't a thing in my house!